L'Ombre dans l'Eau by Diptyque. Image of the skateboarding beauty underneath the bottle is by Daniel Riera for The Gentlewoman magazine issue #13, Spring Summer 2016. Loose ease of The Row Resort 2014 collection. 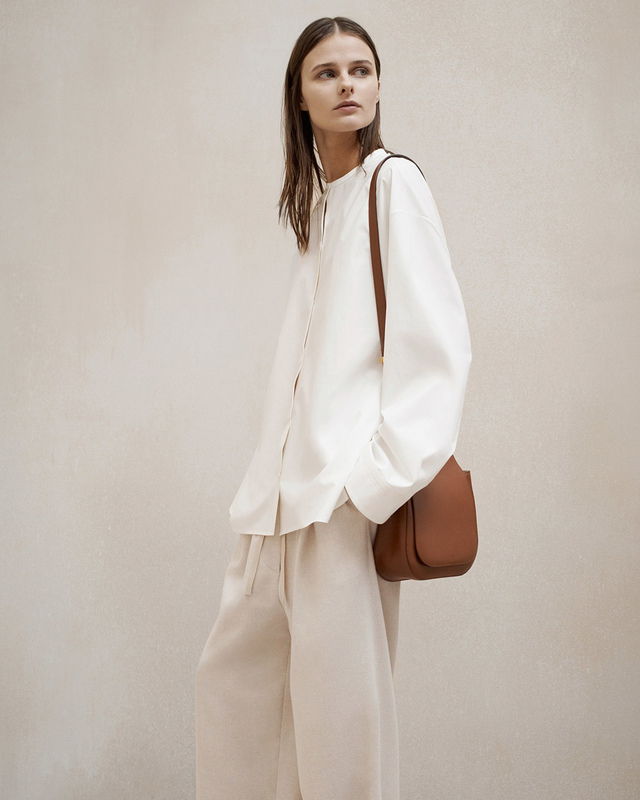 Image courtesy of The Row. Silk blouse by Vince, trousers by Stella McCartney, nubuck pumps by Samuji. If repetition bores us, it also amuses us. Just look at small children, how much they enjoy the same tricks and stories, repeated endless times. Familiar habits, forms, textures and smells bring us comfort. Steve Jobs came up with a uniform he wore every day and had one less decision to make in the morning, and therefore, more headspace. You do not have to wear the same outfit every day to play with the idea. Just take the time to figure out a few solid ensembles you love wearing, your seasonal uniforms, outfits that simply feel and look so nice on, that you would rather wear nothing else. Until, of course, you feel it is time for a new uniform. Lately, for endless times, I have gone back to these fun Stella McCartney jeans – white, high-waisted, flared and cropped to the ankle – worn with chalk white sneakers and a black thin merino turtleneck. For the upcoming weeks, before the wool on wool on wool outfits of the real winter season, I look forward to experimenting with all the silky, lightweight, flowing pieces. Layers of ease and light. I also look forward to wearing my between vacations scent: L'Ombre dans l'Eau by Diptyque. The reason that it has become my Helsinki scent, though, is that the bottle is too big for traveling (light). It is incredible how much a scent, as well as the deliberate decision to go without, does to an outfit. It sets the mood. With its notes of rose and blackcurrant leaves, L'Ombre dans l'Eau smells like a breathing, airy yet well-organized day. You feel good in your skin, you meet interesting people and get things done with ease and focus. You are happy and clear-headed, and everything goes your way. It is never quite like that in reality, reality has more colors and contrast. Surprises, novelties. But taking a moment every morning to look and smell nice, ready to greet the new day, is a good canvas for anything that might happen. More than a look, it is a mindset.